Remember The Bathroom Scene from Psycho?? McCulloch’s Costume and Party Supply has items for all kinds of Halloween decorating. If you think about a lot of the scary films out there, you will remember there was usually a gruesome scene that took place in a bathroom. 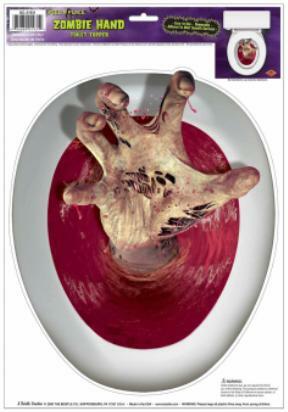 So why not decorate your bathroom for your next Halloween party too? To get you in the spirit of bathroom decorating here are a few items we have to get your brain working on how you can freak out your friends when they try to sneak away for a quiet moment in the washroom! This will definitely make you think twice before jumping in the shower!! 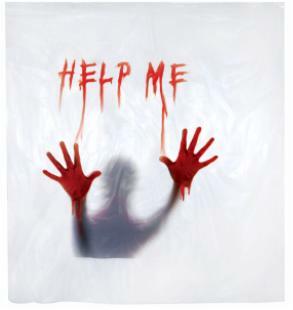 The Bloody Shower Curtain is a steal at just $7.99! 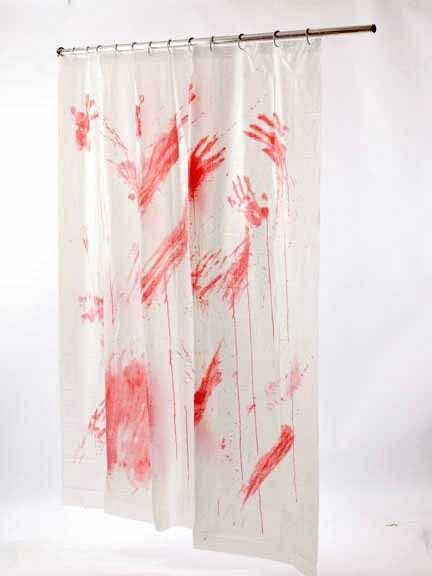 If the first one wasn’t creepy enough, how about the Creepy Shower Curtain? There is someone in the shower!! Your guests may go running for the neighbors to use the washroom with this one in your house! This hot item retails for just $13.99! Now the shower isn’t the only area that can be accessorized. We just can’t forget the toilet seat! 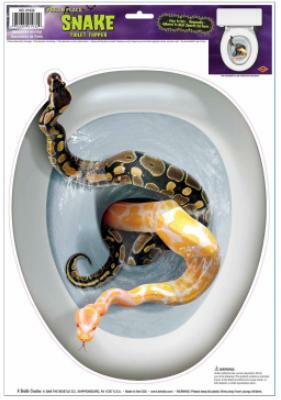 Put this Snake Toilet topper decal on the top of your closed toilet seat and even you will think you suddenly have snakes coming up through the plumbing! And if snakes were bad enough how about a Zombie Hand reaching from the depths of the sewer systems to your toilet trying to grab ahold of your best friend? So awesome! Both of these decals are easy to put in place- just peel and stick. Better yet they peel easily off when you are done with none of that sticky residue you get when using stickers. Both are available in our store or online for just $3.99! And don’t forget! We still have time to do custom orders and get them in time for Halloween, so if you aren’t seeing what you need be sure to ask one of our knowledgable sales associates for assistance. We can probably get you what you need to make your next party a huge success! 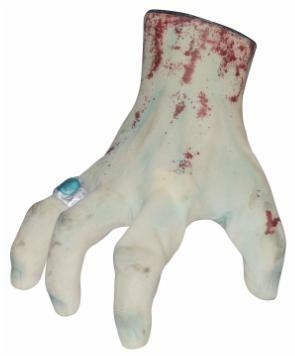 Let us give you a hand to get into the Halloween Spirit! 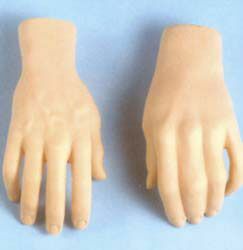 These stage hand props have so many uses and are very realistic looking. The possibilities are endless! Ok your baby really is not that cute!! This prop is a must have! Hit the switch and this ‘baby’ will turn his head, his eyes will light up and he speaks! 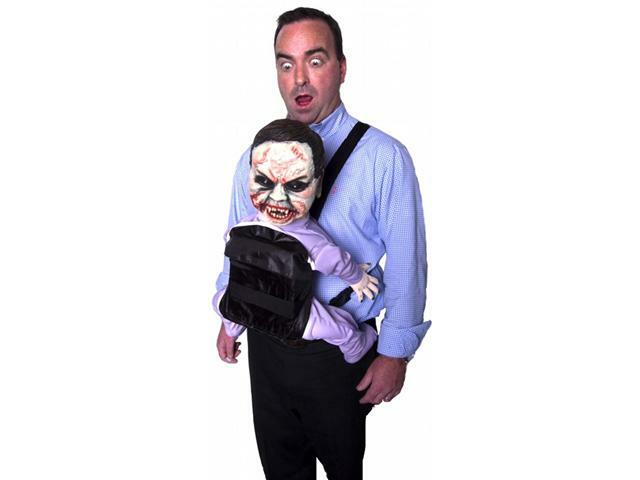 You will definitely turn heads and make people run screaming with this attached to you! And hey, those of you who ride motorcycles: why not put this on when you go out for your next ride? When someone pulls up next to you at a stoplight, hit the switch and watch the people next to you freak out!! Chase your neighbors into the halloween spirit!! This prop works on batteries and is sound activated. 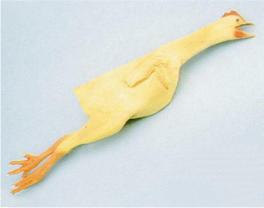 Imagine the fun you’ll have when this senses motion and sound and starts chasing you!! It will definitely scare a few of your friends and neighbours! Check out our online catalogue for more details by clicking HERE! Help your neighbors get into the Halloween Spirit! 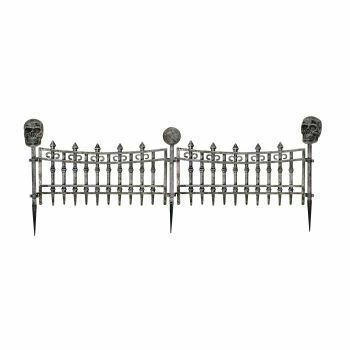 People will see that your house is the spookiest one on the block when you line your front yard with this Skull Fence. Frame out your lawn with multiple sets that easily lock in to one another and all of your neighbors will be impressed….or really scared! Even Trees can get into the Halloween Spirit! 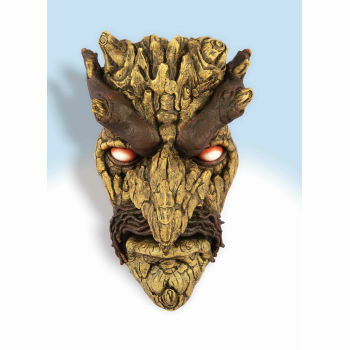 Add some spook to your outdoor decorating with a Haunted Tree Face! You may recall those small wooden eyes and lips that people nail into their trees that have been around for years? While we do carry those, we’ve got something new, better and much more fun this year!! 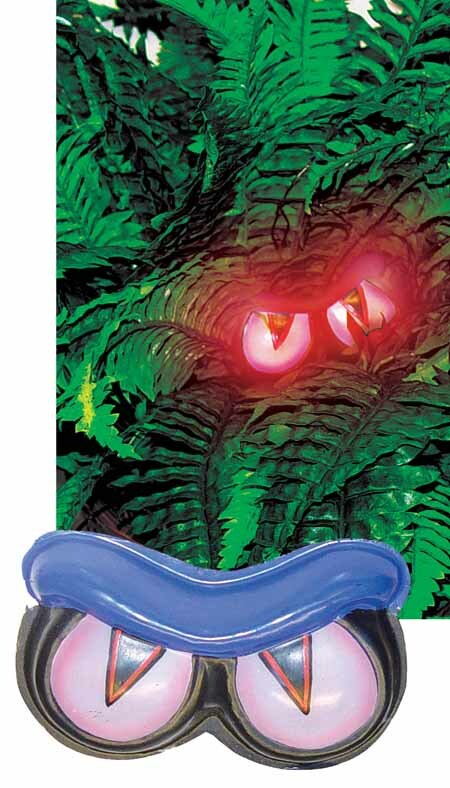 With motion detected the eyes will light up, the mouth will move and a voice will beckon you to come to the tree! This piece is very realistic with its bark-like exterior. You’ll be sure to fool a lot of people and take them off guard! Check out our website HERE for more details! Get your lawn in the spirit of Halloween! In keeping with outdoor decorations this week, get your lawn in the Halloween Spirit at our store! We’ve got lot’s of props to set your house to be “the” house to go to this season. Gothic Fence Posts- stands over 33" tall! Weighted with either sand or water. 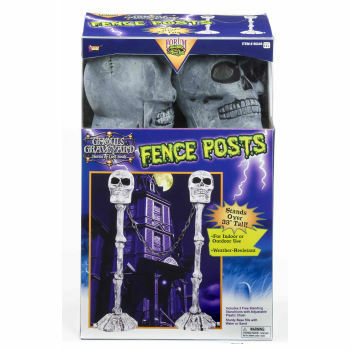 These fence posts are new this year and will definitely add a higher level of spook to your outdoor decorating! Visit our online catalogue for more information by clicking HERE! We are IN the Halloween Spirit at our store! !